Upper Cedar Point Lighthouse was constructed in 1867 as a square screwpile lighthouse. 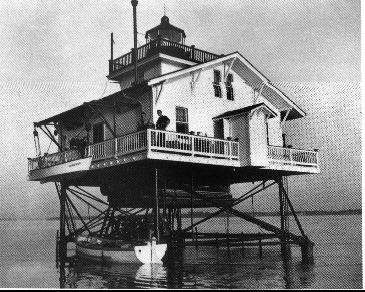 It was located 2 miles west of Mathias Point on the Potomac River. Prior to the lighthouse being built a lightship was placed at this location in 1821. In the 1870s the lighthouse had African-American keepers. The lighthouse was deactivated in 1876 when Mathias Point Shoal light was constructed. After numerous complaints, the lighthouse was reactivated in 1882 and remained operational until 1963. It was dismantled and the current light, a small navigation beacon, was installed on the original foundation. This beacon is accessible by boat only.